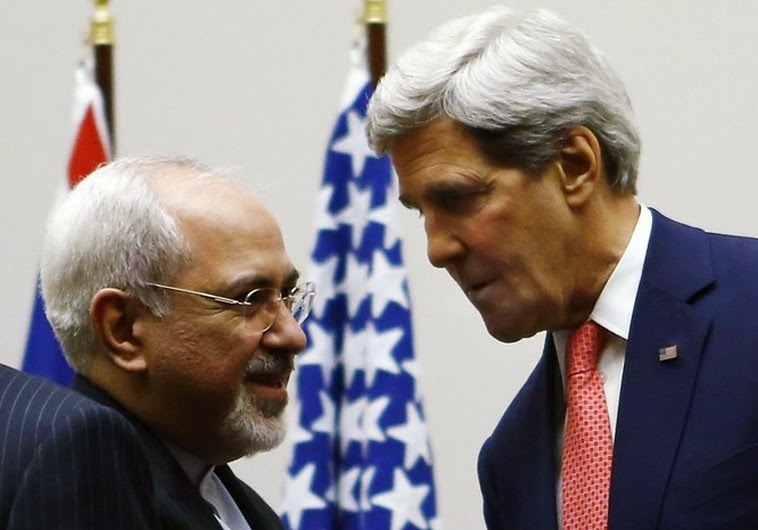 The Obama administration and Iran, engaged in direct nuclear negotiations and facing a common threat from Islamic State militants, have moved into an effective state of détente over the past year, according to senior U.S. and Arab officials. [R]ecent months have ushered in a change as the two countries have grown into alignment on a spectrum of causes, chief among them promoting peaceful political transitions in Baghdad and Kabul and pursuing military operations against Islamic State fighters in Iraq and Syria, according to these officials. The Obama administration also has markedly softened its confrontational stance toward Iran’s most important nonstate allies, the Palestinian militant group Hamas and the Lebanese militant and political organization, Hezbollah. American diplomats, including Secretary of State John Kerry , negotiated with Hamas leaders through Turkish and Qatari intermediaries during cease-fire talks in July that were aimed at ending the Palestinian group’s rocket attacks on Israel, according to senior U.S. officials. U.S. intelligence agencies have repeatedly tipped off Lebanese law-enforcement bodies close to Hezbollah about threats posed to Beirut’s government by Sunni extremist groups, including al Qaeda and its affiliate Nusra Front in Syria, Lebanese and U.S. officials said. [T]hese officials said the intensive negotiations the U.S. has pursued with Iran since last year on the nuclear issue could help stabilize the Mideast and have improved understanding. “The world is clearly better off now than it would have been if the leaders on both sides had ignored this opening,” Wendy Sherman, the lead U.S. negotiator with Iran, said last week. Iranian officials, including President Hasan Rouhani, have said there could be more cooperation with the U.S. in the war on Islamic State, but only if a nuclear accord is reached. Gen. Qasem Soleimani, the commander of the Guard’s overseas operations known as the Qods Force, specifically instructed Iraqi Shiite militias long at war with the U.S., such as the Mahdi Army and Kata’ib Hezbollah, that American efforts to weaken Islamic State were in the long-term interests of Tehran and its allies, said these officials. Meanwhile, the U.S. military is planning to play down and avoid publicity for the annual minesweeping exercise being organized by U.S. Navy’s Fifth Fleet. In past years, the exercise has been used to highlight unified opposition to Iranian activities in the Persian Gulf, according to a U.S. official. Some officials say de-emphasizing deterrence against Iran could be destabilizing, signaling to the Revolutionary Guard that the U.S. isn't going to take steps to counter their measures. However, the U.S. now has gone beyond the use of signals. American officials said the Obama administration has passed messages to Tehran by using the offices of Iraq’s new Shiite prime minister, Haider al-Abadi, as well as Grand Ayatollah Ali al-Sistani, one of Shiite Islam’s most senior clerics. The U.S. has also made it clear to Tehran that its stepped-up military strikes against Islamic State targets in Syria won’t be turned on forces loyal to Syrian President Bashar al-Assad, according to U.S. officials. Mr. Assad is Iran’s closest Arab ally. And the Revolutionary Guard and Gen. Soleimani have mobilized Iranian military personnel and Lebanese and Iraqi Shiite militiamen to fight inside Syria in support of the Damascus regime. Any U.S. strikes on Mr. Assad’s security forces could end up hitting Iranian or Hezbollah soldiers and military advisers, sparking a broader conflict, U.S. and Arab officials said. The détente that has taken hold is filtering into other theaters of traditional American-Iranian conflict, said U.S. and Arab officials. Washington for years has sought to weaken Hezbollah’s political and military power in Lebanon through sanctions and the backing of rival political parties in Beirut. But the threat posed by Islamic State, Nusra Front and other Sunni extremist groups to Lebanon has changed the security dynamics there, said U.S. and Arab officials. COMMENTARY: If this reporting is accurate, this represents a sound position for U.S. to adopt in the war against ISIL. Indeed, Vali Nasr's term of "geostrategic reality" would provide an apt description of this move toward an effective state of détente between the U.S. and Iran. What we would like to see is for the FSA and the forces that we will ultimately generate, train and equip to become the credible force that the Assad government ultimately has to acknowledge and recognize. There is not going to be a military solution here [in Syria]. We have to create so much credibility within the moderate Syrian opposition at a political level . . . that they earn their spot at the table when the time comes for the political solution. Now, there could be FSA elements that ultimately clash with the regime, that may well be the case, as they seek to defend themselves and those areas that they dominate and as they seek to defend their families and their ways of life . . . it could be an outcome. But the intent is not to create a field force to liberate Damascus—that is not the intent. The intent is that in the political outcome, they [the moderate Syrian opposition] must be a prominent—perhaps the preeminent voice—at the table to ultimately contribute to the political outcome that we seek. Gen John Allen is tasked as Special Presidential Envoy for the Global Coalition to Counter ISIL. What's striking by his candid response is how relatively close it approaches the official Iranian position on Syria. For years, the Iranians have been of the position that there is no military solution to the Syrian conflict, and that the opposition engage the Syrian Arab Republic in a political solution. 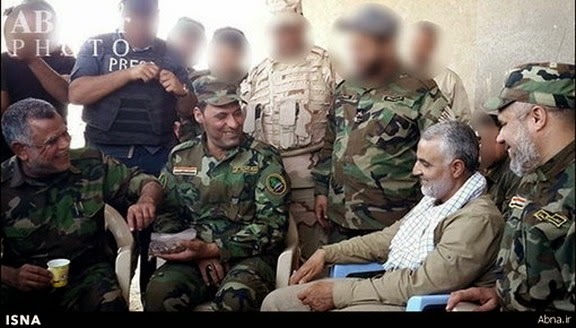 Iranian media has recently been publishing a stream of photos portraying IRGC-QF Commander Maj. Gen. Soleimani inside Iraq among Shia militia forces, most recently engaged in the successful operation to retake Jurf al-Sakhar. Above ISNA photo published earlier this week by Tabnak portraying (left to right) Hadi al-Ameri, head of Badr Organization; Sheikh Adnan Shahmani, Iraqi MP and Shia militia leader; Maj. Gen. Qasem Soleimani, IRGC-QF Commander; Seyyed Mohammad Tabatabai, Deputy Commander of AAH. The Iran-led coalition effort against ISIL to retake Jurf al-Sakhar was named Operation Ashura, of which according to Iranian media AAH played a prominent part. Above: Still from video claiming to depict artillery in action during operation to retake Jurf al-Sakhar. 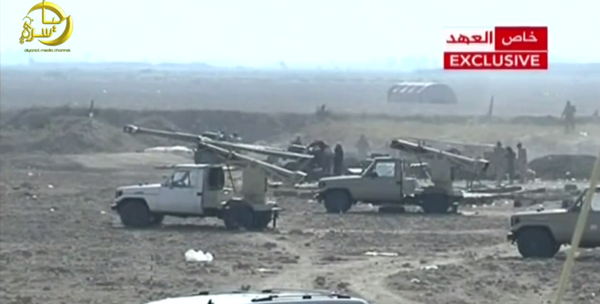 Note, in foreground: Iranian vehicle-mounted HM 27 rocket launchers. So now we might be getting to the underlying motivation for Jeffery Goldberg's drive-by, hit piece on the Obama administration and U.S.-Israel relations. not really. the conflict between Obama and Netanyahu has, at bottom, nary a thing to do with any disagreement over the Iranian theocracy and its subversion of the other states in the Middle East. Solomon's claim that there's some agreement about dealing with ISIS is sound. that there's any deal brewing that will leave Iran operating many thousands of centrifuges and still with an active nuclear weapoins development program is not sound.
" And just what is this mythical "active nuclear weapons development program"?,of which there has never been a credible shred of proof"
ask the IAEA, the UN Security Council...and the governments of every one of the permanent member of the Council. then try asking yourself a couple of questions starting with whether you understand the difference between legalistic presumptions and reality. Understandably Iran don't want to be attacked like in 1980. So in early 1990s Iran set about aquiring a nuclear weapon. The silos is just one concrete proof of Iran preparing the grounds for nuclear deterrence. However Bush's aggressive plan to eliminate Iraq's WMDs changed things in Iran...infact Iran got really scared...the Iranian regime became really worried... they quickly put on hold parts of their nuclear weapons programme, but resumed work in 2005 under Ahmadinejads watch. Right now Iran is where it wants to be in terms of nuclear capacity...they have achieved the "break-out capability", but with all eyes on Iran, it's difficult to go for a nuclear weapon right away. Iran is content and pretty comfortable having the break-out option, just in case anybody get the wrong idea of atttacking or is in the process of launching attacks against Iran. "eyes" are going to remain locked on Iran and any attempt to assemble nuclear weapons is likely to bring an attack on all the nuclear sites....long before any such weapons are ready. furthermore, Iran's economy is being throttled and the sanctions aren't going to go away..... but Iran's economic progress IS going away.